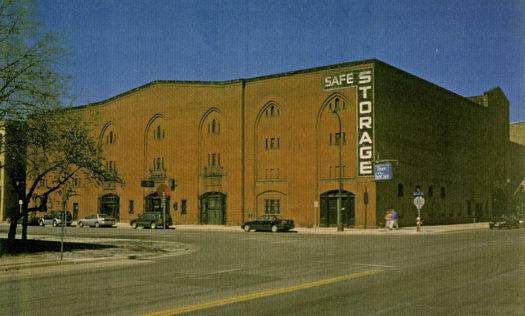 The project that would become known as the Realty Company Warehouse began when Gilbert added one floor to the existing three-story Produce Exchange Building. That first phase was completed in 1896, but further additions to the building continued for nearly fifteen years. Also, a fire in 1899 created the need for additional work. This was the first project Gilbert is known to have designed in Minneapolis. 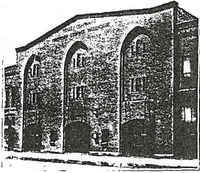 In 1904, Gilbert enclosed the existing structure in brick. He chose Italian Gothic as the point of departure for his exterior design. Small Gothic windows enhance the antique appearance of the building. With some effort, Gilbert convinced the client that the considerable expense of the beautifully designed portcullis on the south entry would ultimately save the owner money because it eliminated the need for a night watchman. The building was under construction for so long due to continual remodeling, including efforts to expand it over an adjacent alley and into adjacent storefronts. Gilbert's client was the Boston Northwest Real Estate Company. He worked on projects for the company in St. Paul, Minneapolis, and Duluth, Minnesota, and Helena, Great Falls, and Livingston, Montana. It was expensive for the company to send Gilbert to Montana, but the company's representative, Luther Gushing, claimed the added expense was worth it because of the poor results it obtained when local architects were hired. The Montana projects were generally for the remodeling of insubstantial, existing buildings. After a long life as a warehouse, the building was skillfully converted into a theater in 1991-92. It became the home of the Theater de la Jeune Lune, which closed its doors in 2008. The building remains vacant in 2010.